Preamble: Sustainability means different things to different region and people. What could be sustainable for a low income, high population country like India may be not be for the USA and vice-versa. For a long time now we have tried only a top-down, technocratic, one-for-all approach to solve the climate problem without any significant success, and since this summit is the last chance to get consensus on climate before the 2015 talks and along with it the replacement of Millennium Development Goals with Sustainable Goals, should we not push the world leaders for a mutual top-down/bottom up approach for mitigation and adaptation? Therefore, if the world leaders could agree over common principles such as emission reductions, yet different practices based on sustainable models for a given context and people, in international and in their respective domestic spheres, the problem of climate change and equity could be solved. To assume an understanding of basic details, often becomes the habit of anyone working immersed in a cause or in a specialized field of knowledge. But, in the case I am about to make in relation to the issue of climate change, it is important to draw out the basic details in order to understand the crucial moment we are all in together, yet the separate/different solutions that we need to work out. So, to begin with it is important to tell the readers the what’s and why ‘ s of two important events: the UN Climate Summit 2014 and the People’s Mobilization. The Summit will serve as a public platform for leaders at the highest level – all UN Member States, as well as finance, business, civil society and local leaders from public and private sectors – to catalyze ambitious action on the ground to reduce emissions and strengthen climate resilience and mobilize political will for a meaningful, universal climate agreement in Paris in 2015 that limits the world to a less than 2-degree Celsius rise in global temperature. The Secretary-General Ban Ki Moon has asked world leaders to come to the Summit to announce bold actions that they will be taking in their countries. There will also be announcements from a number of coalition initiatives that consist of participants from Governments, the private sector and civil society, will address several high-impact areas, such as climate finance; energy efficiency; renewable energy; adaptation; disaster risk reduction and resilience; forests; agriculture; transportation; short-lived climate pollutants; and cities. The outcome will be the sum total of the announcements made by the leaders of government, business, finance, and civil society during the Summit to address climate change, along with a renewed sense of hope, optimism and momentum. The failure of the world community up till now to agree to a post-Kyoto consensus binding all the nations is another reason for the Summit. As the Millennial Development Goals (MDGs) are to be replaced with Sustainable Development Goals (SDGs), the urgency to come to a consensus to fight climate change and its effects makes it even more urgent. People’s Climate Mobilisation is primarily organised by 350.org . It is meant to be the biggest climate march ever! Alongside, individuals can organise their own climate march and be a part of the People’s Mobilisations. But, easier said than done. The UN wants the Nation-States to make announcements (words) to address climate change and the People’s Mobilisations -representing the people- wants action, not words. And in all this, how are we ( the people? ), to view the actions of the world leaders and of the big civil society organisations? Undoubtedly, the lack of seriousness concerning climate change in world leaders, especially of the North, proves the lack of political will and hand-in-glove practices of big politics with big business. But, what of the big civil society organisations that are countering the anti-climate movement ? How can one know the sanctity of their actions? Agreed that they are working for the good of all, but what is the sub-text of their speech? Does their big multinational size and way of working makes them similar to the companies they are against? If not, what makes them different? The answers to these questions are equally important to the central question of climate change as an existential threat. ‘India’s meteoric economic rise in the last two decades has been impressive. There is however a dark side to it, hidden or ignored. Well over half its people have been left behind or negatively impacted; and there have been irreversible blows to the natural environment. Globalised development as it is today is neither ecologically sustainable nor socially equitable, and is leading India to further conflict and suffering. There are, however, a range of alternative approaches and practices, forerunners of a Radical Ecological Democracy that can take us all to higher levels of well-being, while sustaining the earth and creating greater equity,’ 10 says Ashish Kothari, founder member of Kalpavriksha. Sustainability means different things to different region and people. What could be sustainable for a low income country like India may be not be for the USA and vice-versa. For a long time now we have tried only a top-down, technocratic, one-for-all approach to solve the climate problem without any significant success, and since this summit is the last chance to get consensus on climate before the 2015 talks and along with it the replacement of Millennium Development Goals with Sustainable Goals, should we not push the world leaders for a mutual top-down/bottom up approach for mitigation and adaptation? Therefore, if the world leaders could agree over common principles such as emission reductions, yet different practices based on sustainable models for a given context and people, in international and in their respective domestic spheres, the problem of climate change and equity could be solved. Here, I will draw three examples for how India could work out these sustainable practices based on principles (some homegrown, some learned from other countries) to show how this could be done. 1. Learning from its indigenous farmers, a homegrown model: Although India hardly consumes meat, almost every farming family in India owns livestock. Therefore, one needs fodder to feed the livestock used for milk, fuel, field ploughing and fertilizer (cowdung). The US has to grow fodder to feed its cattle. If livestock sector contributes to 20% of carbon emissions worldwide, it is due to the industrial model of production, and the separation of livestock from the fields. In India, Livestock is not grown separately. The very animal used to plough the field, is fed by the straw of fodder left behind from that crop, and the animals faeces feeds that field. With every kilogram of rice grown, there automatically comes four kilograms of straw to feed the cattle. Hence, reduction in consumption of resources (Or using fully/optimally resources) and less emissions. 2. Lessons from Sweden, an imported/shared model: The Swedish model of waste management and waste to energy would help a high emitter like India produce renewable energy, and solve its waste problem! Sweden is a small country. Its landmass is just 450,295 sq. km compared with 3,287,590 sq km for India. It population is even smaller – 9.6 million people compared with 1.2 billion for India. But its industrial innovation is amazing – Sweden manages its energy requirements, using non-conventional sources of energy, wherever possible, to reduce its dependence on oil and also to remain environmentally responsible. Consider this: The country has 242 biogas plants (2012, the latest figures) — 135 use municipal waste water (sludge), five use industrial waste (often waste water), 21 adopt co-fermentation of different kinds of waste including household waste. Approximately 50% of all municipal solid waste (MSW) is converted into energy, and less than 1% of the MSW ends up as landfill (Sweden now has a ban on landfills in place). Around 53% of the biogas produced in Sweden is used as vehicle fuel. In 2013, vehicle gas replaced gasoline and diesel equivalent to about 97,000 cars. About 62% of this was biomethane. 3. 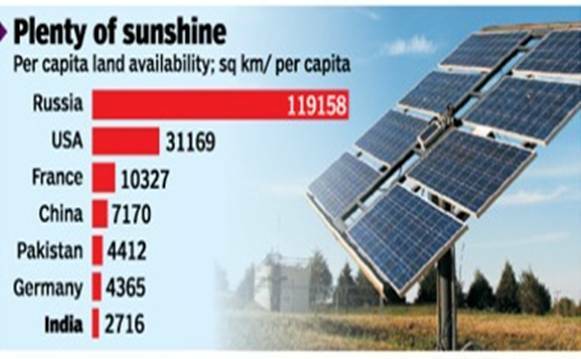 Solar as a solution, a model to be expanded: India has plenty of sunshine. It has many people. India appears to have forgotten something important – rooftop solar. Assume five people to a household. That gives us 250 million households. To be conservative, let’s take just one-fifth this number, 50 million, as households with rooftops. Even a conservative figure of 200 square feet per rooftop (village rooftops can be significantly larger), with 100 watts of installed capacity per square metres, gives us a 2 kW system per rooftop. The 50 million households will thus have a combined capacity of 100,000 MW. That should give us an annual output of 1,600 kW/hour of installed capacity. A bottom-up approach alone is not a viable solution for climate change. Mitigation needs a top-down approach and adaptation needs a bottom-up approach. If not, then the culprit, ie, the rich Northern countries will never mitigate. Top-down is necessary as the countries that have polluted the most and have an abundance of resources are not taking sufficient cuts. And since two thirds of emissions are caused by the Northern countries and the repercussions of climate change are affecting the poor people and the Southern countries the most, we must see the issue of climate change as one of ethics and equity as well. At the international level, we have to be able to agree that each nation will commit to ensure that the bigger polluters are brought to check. This means that the rich and the corporations across the world have to be given mitigation and adaptation targets. We need stricter international and domestic laws to ensure that this happens. At the domestic level, the community and livelihood sectors need to be supported (financially and technologically) wherever their carbon footprint is low to reach a minimum human level and also to develop sustainable alternative models as mentioned above. This would also make the poor economically viable. This article was originally published in Counter Currents. Notes on big NGOs, Climate Change, Green Energy, Cultural Capitalism, etc.